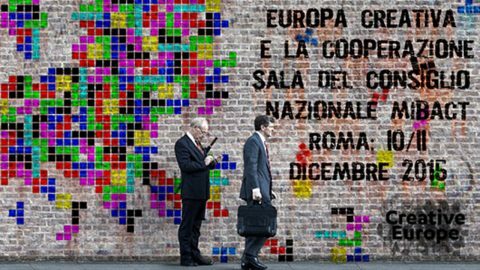 On 10 and 11 December 2015 the Creative Europe Desk Italy organizes infoday the last year dedicated to Creative Europe and cooperation in the cultural and audiovisual sector. Two intense days, with national and international guests, to reflect on the concept of cooperation within and outside Europe’s borders, and extending it to the active European citizenship with the program Europe for Citizens. The two days will be divided into several sessions, which will address various topics including: new priorities of the cooperation projects of the Sub-Culture Programme;forthcoming Under-Media program; best practices for the cultural and audiovisual sector with non-EU countries;European Capitals of Culture and importance of international partnerships; with cooperation of the Western Mediterranean; international cooperation, integration and immigration in the Europe for Citizens Programme. The event is free and is open to all operators in the cultural and audiovisual sector and civil society associations. The simultaneous translation service is available for all participants. Read the program of the event. Entries via online form to availability. For more info: 3311485606 or 3311485671. The event was conceived and organized by the Creative Europe Desk Italy – Culture Office – MiBACT and the Creative Europe Desk Italy – Rome Office Media – Istituto Luce – Cinecittà.